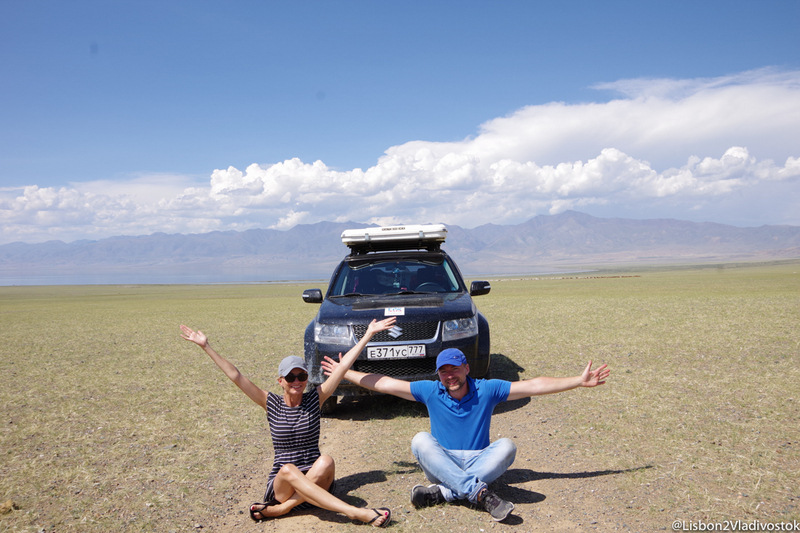 It took a while before we could sort out our thoughts on Mongolia roadtrip. It is a special country that deserves a long post. So get some coffee or tea and make yourself comfortable on the couch. We drove across Mongolia, from it‘s Western border all the way to the capital Ulaanbaatar in Central Mongolia and from there further North. During the journey, we encountered the worst „roads“ on which we have been traveling so far and at the same time the most beautiful nature that we ever experienced. Mongolia was our biggest adventure of the whole trip. We visited remote Buddhist monasteries, rode on camels through the desert, hiked over mountains and volcanoes, camped on lonely lakes, drove through rivers and climbed the largest Genghis Khan statue in the world. All these places are connected by roads that seem to be from the 13th century, the age of Mongolia’s greatest hero. Right after the border crossing in Kosch-Agatsch/Taschanta we drove on sand, gravel and stones for so long, that we already expected to strand somewhere with burst tires, broken axles or a torn off gasoline pipe. Already on the first night, we realized that Mongolia will not be easy: After a strenuous ride we camp near a deserted village (Nogoonnuur) and spend the night somewhere close to a marsh. It is already too late and too dark to continue so we had nothing left but to stop somewhere in the middle of nowhere. But the worst part was the swarm of mosquitoes which surrounded us immediately since not many people seem to camp around here. We could not get out of the car without being completely eaten. After a quick dinner inside the car, we quickly pitched up the tent and hoped to survive the night without being eaten. In the morning we want to get away quickly and start the engine before 7 o'clock. Our destination is Uüreg Nuur, a mountain lake which, according to Google is supposed to be about 90 km north of the village. I promise Dima a breakfast and a shower at the lake. We set off in the supposed direction, but again and again, we stand in front of the swamp, which seems to surround us and is unpassable. According to our map, there should be a road and in our search, we are making a bigger and bigger curve to find it, but instead always land in front of a new swamp. The road is hell: It is full of rocks, which constantly hit the bottom car frame. After two hours we have not come any closer to the lake, but are both soaked in sweat. We do not know what to do and decide to return to the abandoned village in hope finding somebody who could help us. At the bank on the central square, we actually meet someone. We manage to make our problem clear and ask for directions. Without further ado, the guy drives away to call someone for help. The lake seems to be well-known, but the way there through the swamp is very dangerous (even for the locals). There are only very few places that are passable and the risk of getting stuck is very high. By using their hands and feet they tell us that we have to take a detour of 200km - instead of the 90km planned initially. We are supposed to drive around the mountains in the direction of Ölgii, then at some point there will be a main road going North in the right direction. We are to cross the river on the southern shore of Achit Lake, because it is the only bridge across the swamp. After they draw a quick sketch for us we get going. After two hours of driving, I start panicking. There is no road in sight, but dead animal bones everywhere. Two huge monster vultures are circling above us and my biggest fear is that Kolya will break down given the dreadful road conditions and the hot desert around us. After nearly three hours, we see a dust cloud in the distance ... yeahhh another vehicle. As we get closer, we can hardly believe our luck: it is indeed the main road which we were looking for. Well main road means it is a slightly wider sandy path, without the annoying stones. In five hours we have come about 80km far. We stop and meet a Russian UAZ bus with at least 15 drunk policemen in it. They seem to go in the same direction and tell us that we can follow them. We try that first, but since they are taking a break every ten minutes to drink more vodka, we decide to part with them. Later we meet a Russian guy, Misha, whom we have already seen at the border. He is also driving to the same lake as we are and knows the way. With his huge Dodge he finally leads us over stones, mountains, mud holes to the most beautiful lake of Mongolia. The journey is the reward and ten hours later without having had any breakfast we arrive at a true natural wonder. Clear water surrounded by still snowy mountains. Exhausted but happy we set up our camp. I'm proud of Kolya, the best car in the world, and Dima, the best driver in the world. As a medal - the horns of a mutton. As we have learned, there are very few asphalt roads in Mongolia, mostly around the major tourist centers and in the capital. An estimated 80% are simple dirt roads, with lots of sand and some sharp stones. Spare tires are a must here and you hardly see a car without at least 1-2 replacement wheels with it. Many of the small paths often diverge and in the end, they all come together again. A compass provides better direction than a sat nav. If you want you can open a new road and fight your way through the mountains and valleys - there are no traffic signs, markings or hints. Not even Google knows the Mongolian roads and if it does, there is no network anyway. So we have to rely on an old-fashioned paper map, which is far more helpful here. This sign on the main road made us more than happy. We have been in places which were so quiet that you could hear the eagles flying from far away. We bathed in lakes with crystal clear, blue water without a soul around us. Almost as many horses as humans live in this country and probably there are only a few places left in this world where it is so quiet and calm. Mongolia has less inhabitants than Berlin, but they live on a surface which is five times larger than whole Germany. Our journey led us through Tariat, Tsetserleg then to the former capital Khakhorin and finally to Ulaanbaatar. Inbetween we celebrated Dimas birthday in the hot springs at Tsenkher (near Tsetserleg). Since we did not make it to the Gobi desert, we drove by the Mongol Els, the Mini Gobi. On camels we rode over the 70km long sand dune. A fantastic experience. Ulaanbaatar (UB) was more sobering after the fabulous peace and nature we experienced before. This city gives off the impression that it has grown without meaning and reason: We could not recognize any system of city planning, no meaningful architecture, no parks or something that makes a city worth living. On the contrary: gray concrete, exhaust gases, lots of cars and dust. The Gandan Monastery with its large Buddha statue stands amid skyscrapers, rubber tires are used as flower beds and you have to watch your step otherwise you fall into one of the many asphalt holes. The trip to the world's largest Genghis Khan statue has cost us almost a whole day, as the traffic had been horrible around the capital. But heyyyyy, there is Doner Kebab! After UB we need to recover from the city stress and head to the monastery Amarbayasgalant. Surrounded by green hills and far away from settlements, we can breathe fresh air again here and are even allowed to attend a Buddhist ceremony. We had many questions as we were driving through Mongolia. Many speak of the hospitality and friendliness of the Mongols, however, we had rather strange encounters along the way. Often in the evening young men from the nearby yurts came to our tent on horseback or motorcycles. Instead of starting a conversation, they just stared at us most of the time. Any attempts on our part to start a basic conversation or show them something have failed. They just stood there with empty eyes and motionless faces and then just left. Mostly leaving boozy breath. Drinking is a big problem among the Mongols, because bad booze is cheaper than healthy food and this has led to increased dependence in recent years. In the two weeks we could not really get through to the people and we do not know exactly why. It is a daring claim and may not be fair, but we feel there is a tremendous education gap in the country. The expressionless faces that looked at us, the alcohol, the laggardness of many people, are just a few signs of it. The infrastructure is in poor condition, the few paved roads are built by the Chinese, the houses in the bigger cities were built by the Russians. We have not encountered a real economy, even though Mongolia lies between two powers, such as China and Russia. The worst thing in this beautiful country is the garbage. No matter where the Mongols stand, park, grill - they leave their garbage everywhere. Although we collected huge bags of waste on lakes, it was only a drop in the ocean. It is sad and bewildering how they pollute their magical land. People who are Buddhists or who believe in shamanism, who are guided by natural spirits and are dependent on nature as nomads, corrupt their land and destroy what they have. Do you have to learn in school that you do not throw garbage into nature? Is there no common sense? We are speechless, disappointed and often feel very powerless. Nevertheless, Mongolia has given us so much. It is a special country, which feels like being on a different planet. The whole country is a single campsite, you can stand where you like and as long as you want, without anybody bothering or disturbing you. With all the endless open landscape we felt closer to heaven. Let's hope that it will stay this way for quite a while and that the Mongols will someday come to their senses. If you travel by car to Mongolia, do not save money on tires. The investment in our General Grabber AT3 really paid off. Sharp stones, mud holes and sand were no problem for our Suzuki Grand Vitara. We think that without a 4x4 it will be quite difficult to drive through the country, a situation similar to Kazakhstan. Nevertheless, we have seen many Toyota Priuses who have fought their way through all the roads. In fact it is a very popular vehicle in Mongolia. Get a road map. We started without one, but Google Maps did not work in Mongolia and the network signal is also rather bad.